I have a new obsession: Shredded Chicken. But first, my original inspiration for making dinner on this particular night was a recipe I have had my eyes on for like, a year. What’s really weird is that the post on The Girl Who Ate Everything came out exactly 2 years ago today! I was finally all ready to make her Buffalo Chicken Mac and Cheese when I spotted a big bag of potatoes. I totally forgot I even had them. Hm… what can I do with the potatoes? 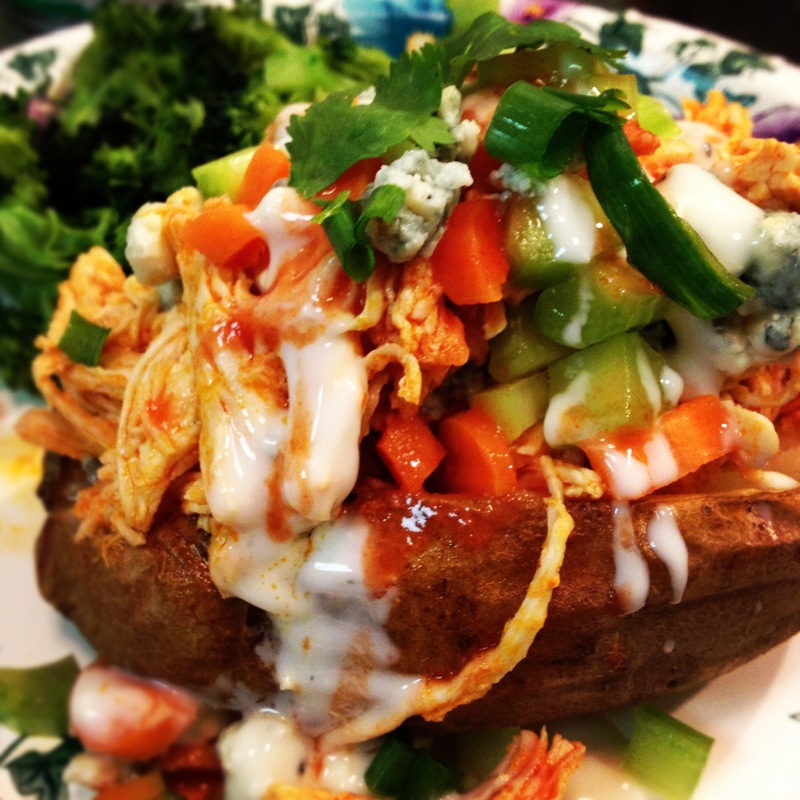 I got it: Buffalo Chicken Stuffed Baked Potatoes. YUP- that’s it! So, for this recipe… you really only need to use one chicken breast for every two servings (potatoes) if you’re using the normal sized chicken breasts. If you use the thin sliced cutlets, you probably want to use one chicken per potato. Everything else has no measurements because you can really do whatever you want with it! 2. Meanwhile, cook the chicken breasts either by boiling them or sprinkle a touch of salt and pepper and heat them on a cooking spray coated grill pan. Remove from heat and cool. 3. Now, chop up some celery and carrots. I used a handful of baby carrots and two celery stalks. Put aside. 4. Take the chicken and shred them using two forks. 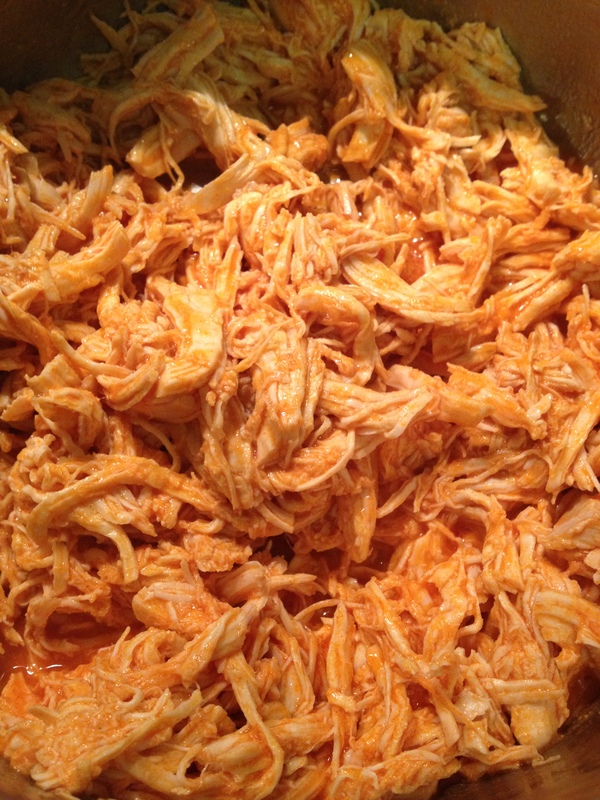 Put the shredded chicken in a medium-sized saucepan with a Tablespoon of butter and as much hot sauce as you’d like. I probably started with 1/4 cup. Let the butter melt and mix everything together. Keep on warm/low heat. 5. Remove potatoes from the oven. You’ll know when they’re done when a fork can easily go in and be removed. 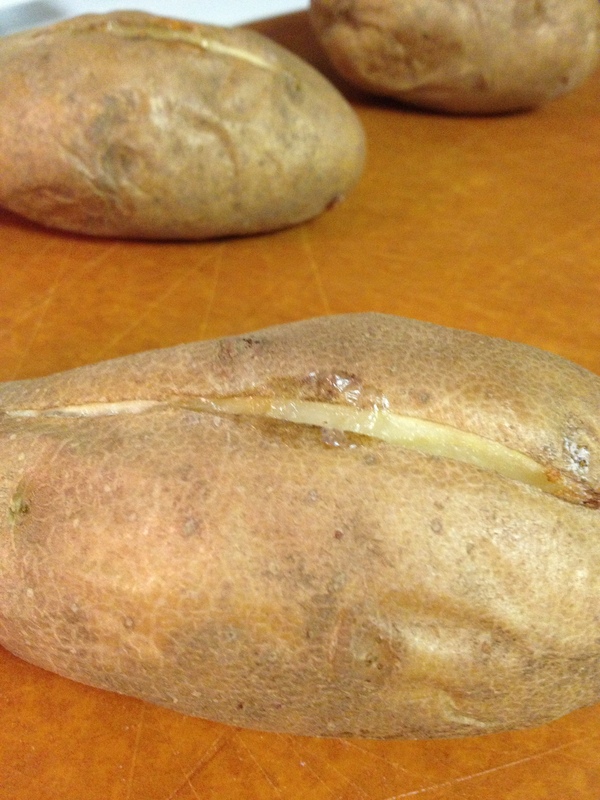 Squeeze each end of the potato to open up the cut you did earlier. Stuff with a spoonful or two of the chicken, then put on some celery and carrots, and a teaspoon of Blue Cheese Crumbles. Repeat. Now garnish with some Cilantro and Green Onion, Hot Sauce and Blue Cheese Dressing. I want another now! So yummy! So, this ended up being a great idea, right? OMG. YUMMMM. First of all, it tasted just as good as it looks in these pictures. For real. Also, I had so much chicken leftover, that I was able to use it in two other meals I made that week. Shredding the chicken makes it look like there’s so much more… and I guess it makes it last longer too. The sauce can also get all nice and soaked up in the chicken. This one’s a winner, and I’ll DEF be making it again. Now, if I can only get my act together to make that Buff Chick Macaroni and Cheese! Pingback: What are you having for dinner tonight? This looks AMAZING!! We love anything Buffalo flavored so I know this is going to be a huge hit. 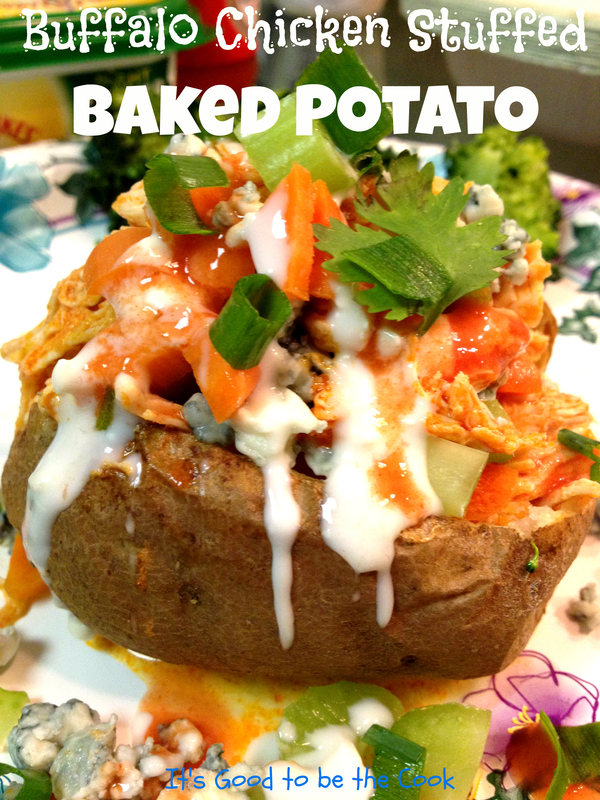 Minus the blue cheese (I may try a vegan blue cheese recipe I found), and using vegan butter I am so making this next week! Thanks Steph! I was pretty excited about it too… I don’t know if you even need the cheese… you could also do a Vegan Cheddar (i think I’ve seen that before) since Cheddar is sometimes mixed with Buffalo things. OR- you could cut the cheese (lol) and do some Avocado, it will taste really good with it and provide the non-spicy creamy/cooling factor that the Blue Cheese adds. Let me know!!!!!!! !